Doing the right thing is standard policy at Pepper Viner Homes. It is a philosophy that drives every facet of the way we do business. It is the reason we created DESIGNflex, our unique program that let’s you customize the interior of your new home. It is why we set the highest construction standards and make sure they are met every step of the way on every home. Our High Performance – High Design homes are doing the right thing for both you and the environment. They protect your natural resources while they give you certified energy savings. 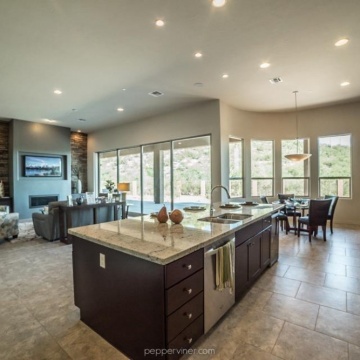 Pepper Viner was selected as Southern Arizona Home Builder of the Year in 2013. This is the fifth time we have been awarded this prestigious honor. We are very proud to have been nominated and chosen by our peers. I am very satisfied with the construction of the home. The only thing I have a complaint about is the strip of land outside the house that gets muddy when it rains because they didn't put gravel down. I heard about them travelling down the road, plus my sister-in-law highly recommended them for not just their craftsmanship but the quality and efficiency of the house itself. We are impressed with the process and the final result. Joe was great to work with. The schedule worked out perfectly for us. The budget was exactly what we expected. The workmanship and materials turned out better than what I was expecting. At times it seemed that Jason in sales was overloaded with projects and we observed delays in getting responses. Once he did respond he did handle our issues in a very satisfactory way. The delays caused frustration on our part as we were told we had only one point of contact. Perhaps consideration could be given for a second point of contact like an admin assistant. I think the Sedona and this location was a great value. My experience has been excellent with Pepperviner following through on commitment. I heard about them through word of mouth and signs being posted. So disappointed with this company, right from the beginning, first, its September, then late October, which turns into mid November just to close. Next, it rush rush to close because Joe is going on vacation and the house was a mess when we took possessions. It wasn't even clean!! So many unfinished items, the blue tape is still up in many places. Then Alma is supposed to come over at 10 AM and winds up being 45 minutes late, no phone call, just annoying, one thing after another. So no recommendation from me. Had a few glitches when they converted to a new computer system. The employees were very organized & lovely to work with. The dates slid a few times due to the availability of the sub-contractors which was out of their control. I was completely responsible for the overages. I kept finding upgrades and they kept putting them in for me. My bad. I had Jason and Joe on speed dial. They kept me completely in the loop. Joe, the project manager, selected his top tile guy since I had massive amounts of tile and Javier was a true artist. Very pleased. Absolutely hated the recommended loan company, Nova. Instead of giving me a complete list of the items needed they kept coming back to me for '1 more thing'. I was already completely approved through another company and the only thing that kept me with Nova was the $4,000 credit that I received from Pepper Viner. Joe, my project manager, was absolutely fabulous. A perfectionist and always had his eye on the detail. My forever home is everything that I had hoped it would be. Internet. I was looking in Tierra Linda and was not happy with the homes from the other builder and found that Pepper Viner still had a few lots left from the 1st phase. Best decision ever! I don't plan on ever moving but if I hit the lottery Pepper Viner will be my first call! Likely to recommend with caveats (see below). home was ready a month early than originally told it would be done. I love my home and the area. I have been thoroughly pleased and impressed with my experience with Pepper Viner Homes. Shelby was highly knowledgable, and an excellent resource during the initial stages of lot and model selection, all the way through the design process. She was extremely professional by responding to any inquiries efficiently, helped to problem solve any issues that arose, and always seemed to have my best interest as a first time home buyer. Tim did an excellent job of communicating the building process and all that might entail. He was patient and took his time to ensure everything was completed correctly, and with good quality. Any repairs that have arisen after move-in have been promptly addressed and taken care of by Alma. She is highly efficient and always follows-up to ensure the work was completed. Overall, I could not have asked for a better experience in building a home. Everyone I worked with, and the end result that is my home have exceeded all expectations. I would highly recommend Pepper Viner developments to anyone looking to purchase a home. Amazing craftsmanship and I am beyond happy. Everyone that I interacted with who was employed by, subcontracted through, or associated with Pepper Viner was professional and communicated with me timely and effectively. Very few issues came up during the building process, and the few that did we're resolved quite promptly. Shelby Mowrey did an amazing job for me. She kept a keen eye on my house project, knew my needs, was able to identify a few issues as they arose during the build, and get them solved for me. She was proactive and helpful through the entire process. I've had a home built before through Centex Homes... To their detriment, they did not have anyone working directly with their clients and I had no point of contact for things that came up during the building process. Shelby not only was a great point of contact, but she exceeded my expectations on so many levels. Newspaper ad about homes for sale. We dealt with Janet Koller and she was amazing. She is very friendly, knowledgeable and professional. She went out of her way to help us in anything we asked for and answered all of our questions and concerns. Janet was great throughout the whole process. I will let Janet know if I do. I always got a call back and an answer promptly. I never felt out of the loop or unsure. Considering there are many house being build at the same time I am amazed at how well they manage noise especially. As a couple in our 80's, we were worried about the stress of building at our age. On day one of walking through the door, Jason set us at ease, listening to every detail we mentioned and defining things we conjured up. He even caught some things we didn't think of and always seemed to be looking out for us. Joe was great also. He took pride in making sure the house was right and delivered a beautiful home. This was the best building experience we have ever had. We are very impressed to say the least. It took a long time to finish the house. It took 7 months and we had to change our schedules to accommodate them. The project manager was very good. The project manager was good. I was driving around and liked the area. I also like the style of the house. 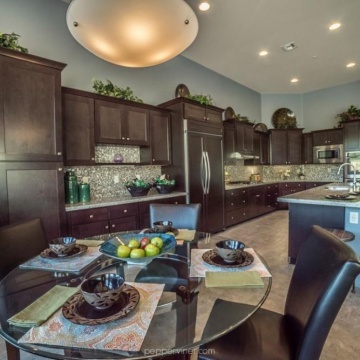 Pepper Viner Homes met and exceeded my expectations by making it a smart home. I have known of Pepper Viner Homes for a very long time. They happen to be building a community near the medical center. I have already referred them and maybe buying already. Interaction with Joe and Jason was professional yet friendly. We greatly appreciate the time that both Joe and Jason gave us during our build. Always helpful and informative. Our interaction with the subcontractors was virtually non-existent. If we stopped by and they were working, we were respectful of them and they of us. AC condensate line should be run further away from the house. We found that we had standing water problem from the constant dripping. We found this issue ironic considering how strongly it was stressed upon us, verbally and written, to not plant anything near the foundation or fence with regards to termites and foundation undermining. The master bedroom does not get adequate cooling. Location of refrigerator is problematic with regards to opening the refrigerator door against the wall as well as not being able to fully open the interior crispers. Comments above aside, we are very happy with our new home. We greatly appreciate that Pepper Viner saw the need to add gutter over our living room area to handle the issue of rain run-off and possible water intrusion. We plan on living here for many years and feel confident that we have a well-built home. Friends visited the Silverbell Commons development and recommended we come take a look while we were all in Tucson looking at potential new homes. The Topete and Prather's are happy that we took the time to visit the development. Area 51 was the biggest hiccup in this whole construction. We emailed constantly and got no response from them. We moved into our house and wasn’t able to setup our alarm system or sound system for almost a full week. It was going to be 2-3 weeks after we moved in until we went higher up the chain to complain. Janet is incredible. She made this whole process so easy and smooth for us. She took care of our needs every step of the way, understood our vision for our house and was our greatest advocate in getting what we wanted. We cannot stress enough how much we love Janet! I’d consider buying a Pepper Viner home again all because of how well Janet took care of us. Thank you. My custom bathroom is exceptional. The windows throughout the home give an artistic touch of light. My home is lovely, and when the final inspector compared to other homes you can see that it's a great value with unique and enjoyable features. I stumbled into the house when looking at new homes. I had been looking at a Mesquite home in Wrightstown. Then I went to Lennar as I wanted a new home. I stumbled into the Schoolyard while in the area, and they told me that Elementary Place would be opening up with high ceilings (which I am overjoyed with now). At that time there was no model, and I was looking at a home with Dr. Horton that was 2 stories that I loved but hated the location. I anticipated that I would want the Sullivan, but when I saw the Dickens and even the Thoreau, they were charming with a good location. The Sullivan seemed cramped with all the extra space spent on the stairwells rather than a home to live in. The view was gorgeous in the Sullivan, but it really wouldn't work for a family cramped upstairs. By that time I had learned of Park Modern and I liked the idea that Pepper Viner was local yet modern with personalized options as well as some custom aspects. I love the community of Tucson, my work is committed to the community, and working with Pepper Viner alligned with my community based ideals. Home was completed before estimate time. We still have things pending, but I would rate what's been done so far a 5. I feel the company met or exceeded my expectations in terms of the entire process. I heard about the company throughout the community. I would rate the employees and subcontractors that I dealt with a 5, but I didn't deal with very many. Pepper Viner Homes exceeded my expectations in that the time it takes to get things done was very efficient, and communication with us was great. We heard about the company because their community is actually a mile away from where we used to live, and we had driven past and saw them.